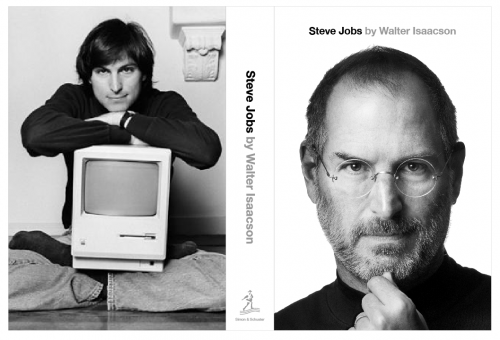 AllThingsD reports that Simon & Schuster has rescheduled release of Walter Isaacson's authorized biography of Steve Jobs to October 24th. The previous date of release was November 21st. The fully authorized by Steve Jobs book is based on over 40 interviews with Jobs and interviews with over 100 of his friends and family members and will include full details on Steve Job’s life. The Wall Street Journal reports that Isaacson last interviewed Jobs four weeks ago. At that moment Jobs already knew that he would die soon. The last interview will be included in the book. Of course, the book causes a great interest of Apple fans. Since yesterday the book orders on Amazon has increased by 40,000%. Yesterday during the expected media event Apple announced the new iPhone 4S, an upgrade to the existing iPhone 4 with improved A5 processor, new 8 MP camera with better optics, faster download speed on 3G, Bluetooth 4.0, and more. Media members who attended Apple's iPhone 4S event had the opportunity to spend some time with the new hardware following the presentation, and immediately started posting their first impressions about the iPhone 4S. The most impressive part was the demo of Siri, the new assistant that lets you do just about anything you can do on your phone — but with your voice. We tried to psych it out with a bunch of random requests... Siri never faltered, never missed a beat… There’s nothing better to say than that. We even sent ourselves a few text messages, which Siri transcribed to a T. Of course, the lady on the other end still sounds eerily robotic, but we’re hoping for smoother responses from the alien within in a future update. The current model has three bands — one on each side on the bottom, and one on the top. 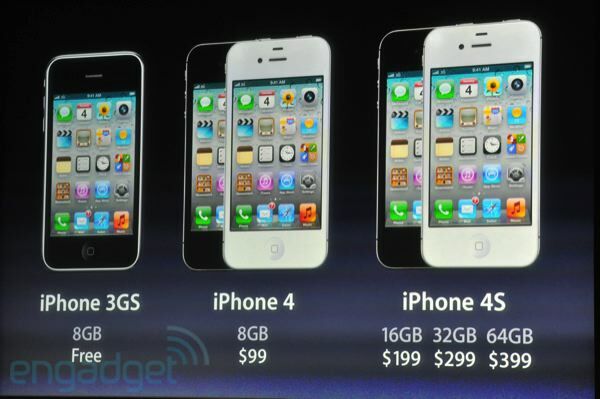 The iPhone 4S has four bands — two on the top and two on the bottom. The bands are where Apple houses the antennas for the device. The Wi-Fi, wireless and Bluetooth technologies use these areas. It’s not clear at this point if Apple moved any antennas or what they added the extra band. 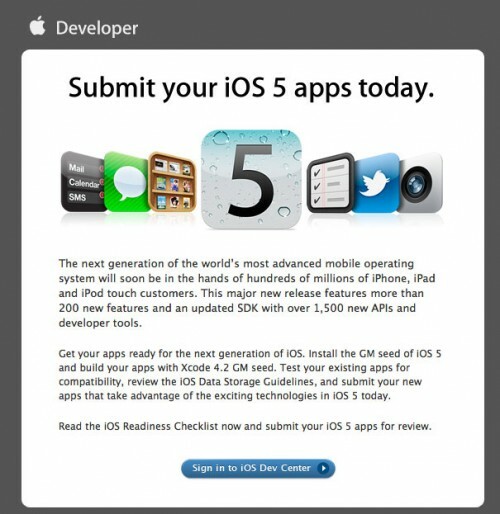 Yesterday Apple announced that iOS 5 would be released on October 12th and seeded the Golden Master copy of the new software to iOS developers. And now the company is asking their developers to start submitting iOS 5 applications for the App Store ahead of official release of the software. This gives developers a chance to test better their applications and make necessary improvements before the final shipping of iOS 5 version of the applications. Noteworthy, Apple has already been approving many iOS 5 applications. iOS 5 is promised to deliver over 200 new features and will be compatible with the iPhone 4, iPhone 3GS, iPad 2, iPad, and the 3rd and 4th generation iPod touches. The prices are just like on an image above. iPhone 3GS 8GB is free and iPhone 4 8GB is just $99 - with contract. 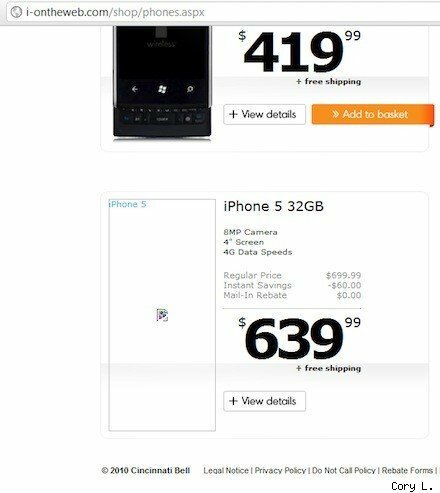 And yes, according to the Apple Store in the US both iPhone 4S and iPhone 4 are available with Sprint, AT&T and Verizon. Unlocked iPhone 4 8GB GSM costs $549 in the US. 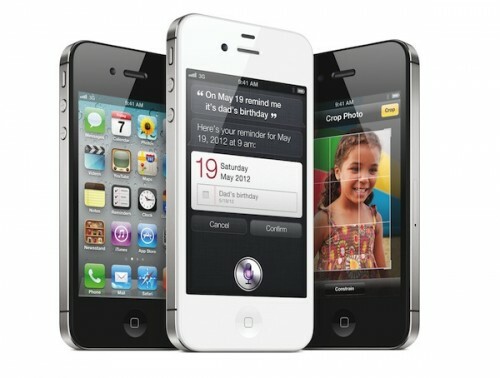 There is no information yet about unlocked iPhone 4S availability and prices. The most part of rumors about the next generation iPhone was focused on its external redesign. But the one thing we almost definitely sure in is that the next iPhone will have the much faster dual-core A5 processor with a much faster graphics processing unit (GPU). 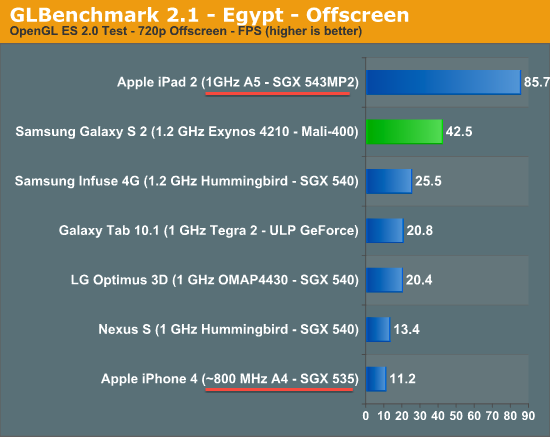 The A5 chip is implemented in the iPad 2 that was released in March. Apple claims that the graphics performance of the iPad 2 is up to nine times faster than the graphics performance of the original A4-powered iPad. The recent graphics performance benchmark tests, conducted by Anandtech, (see above) demonstrate how much faster A5's GPU as compared to the A4, suggesting how much faster will be iPhone powered by A5. iPhone 5 was accompanied by a $639.99 price tag and a handful of specs: 32GB, 8MP camera, 4" screen and 4G data speeds. These specifications align with most of the rumors that we've heard about the device. 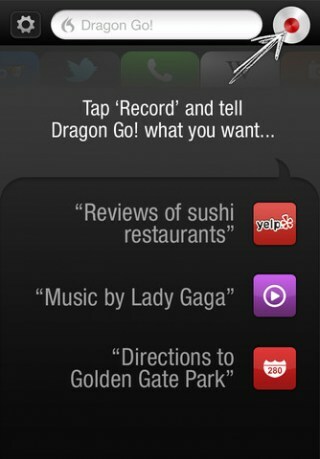 In July Nuance released iPhone app Dragon Go! that has nicely combined voice recognition technology with intelligent search functionality. Today the company released updated version of this app (free download) with a number of new features added. Specifically, the update includes support for media content on Netflix, Google+ public posts and search engines Wolfram|Alpha and Ask.com. Besides, the Yelp support was improved and now you can see a map view directly within the Yelp tab. M.I.C. 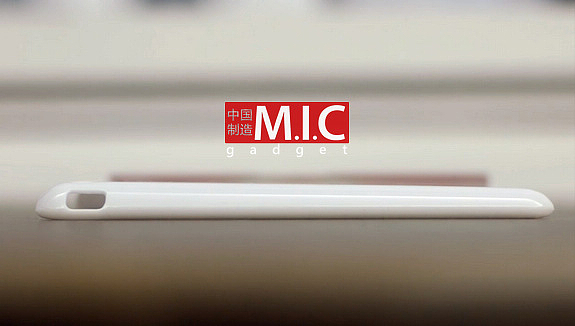 Gadget is reporting that iPhone 5 prototype device was lost by Foxconn or possibly stolen. That is why there are lots of iPhone 5 cases in China today. The design could really be the final one since case manufacturers must be very certain to have shipped "thousands" of cases already. Producing a mold for silicone case costs tens of thousands of RMB (thousands of USD) and a mold for hard plastic cases costs even more. A case supplier told that a device had gone missing from the Foxconn factory in the Shenzhen Futian district. The prototype was disguised in a case to make it look like the current device. It was apparently a test model with a finalized iPhone 5 teardrop chassis but only had slightly modified iPhone 4 internals. The person who had access to the prototype wiped the phone's software, thus disabling the GPS hardware needed to track it down. It was then allegedly sold to one of the iPhone case manufacturers for RMB ¥20,000 (about $3,100). We were told that Foxconn was aware of the loss and had penalized internal management for the incident. We also heard from another source that the person who "lost" it was paid to do so. We are very sure that one or more of these case manufacturers have access to what is believed to be the prototype of the iPhone 5 with the finalized design. It is not simply getting tipped on the dimensions and shapes of the next iPhone to make the molds. By looking at iPhone 5 case photos one can say that the future iPhone 5 has teardrop desing. 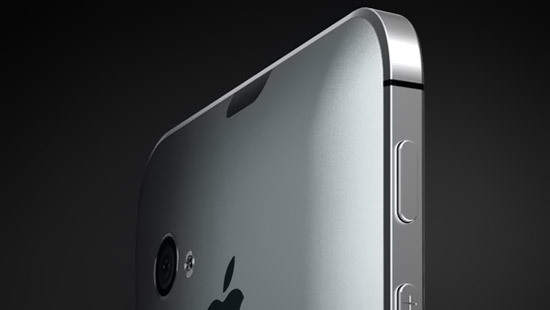 It is much thinner (33%) than iPhone 4, but a bit larger in height and width. The height of the case is 4.84 inches (12.3 cm), width - 2.72 inches (6.9 см). The dimensions of iPhone 4 are 4.5 x 2.31 x 0.37 inches (115.2 x 58.6 x 9.3 mm). Apple is reportedly working on a process to merge multiple Apple IDs into a single login. 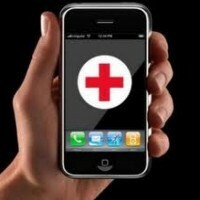 Early developer testing of iOS 5 and iCloud have demonstrated that this issue was major. Some readers have been managing two Apple IDs on purpose and are now frustrated about the fact that Apple is restricting logins for automatic downloads. Others have only just discovered that they have two IDs. Most of them have already contacted Apple, only to be given the same answer without exception: Apple will not consolidate Apple ID accounts. MacRumors reader Robert emailed Apple CEO Tim Cook about the issue. Apple representative said that they understood the issue and that more people would run into the problem with iCloud, claiming that there is no way yet to combine accounts but revealed they are working on it. According to a source testing the feature, it works almost identically (video above) to the Android operating system’s speech-to-text feature. It’s also very polished, quick, and accurate said the source – which is obvious for being an Apple product but also is indicative of the product being nearly complete. The special microphone button was already noticed in iOS 5. This allows users to dictate rather than type. It seems that Apple plans to release its Nuance speech recognition system alongside the public release of iOS 5 set for launch in this fall. Apple’s current generation of MacBook Air is very popular with customers. Apple sells up to 500,000 units per month. 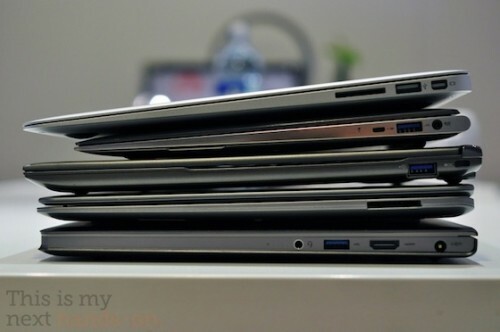 MacBook Air’s success has drawn the interest of “Ultrabook” models’ manufactures whose aim is to compete with the MacBook Air. Intel and Windows PC seem to test the waters, limiting initial shipments to a combined 50,000 units. 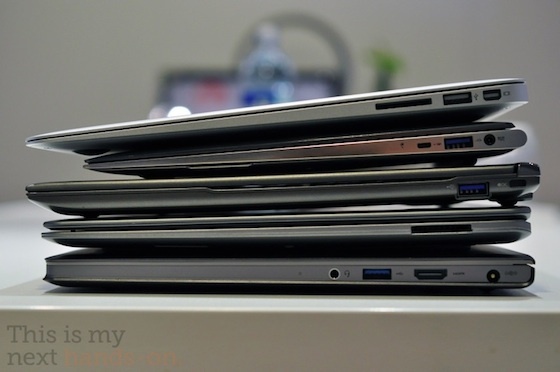 First-tier notebook brand vendors Acer, Lenovo, Toshiba and Asustek Computer, understanding that demand for notebooks is unlikely to recover in the fourth quarter, while Apple's products are taking up all the glory in the market, will limit their initial Ultrabook shipment volume to below 50,000 units for testing the water, according to sources from notebook makers. Intel planed that Ultrabook pricing will start under $1000 but the company faces difficulties trying to bring costs to the point where they can compete with the MacBook Air. 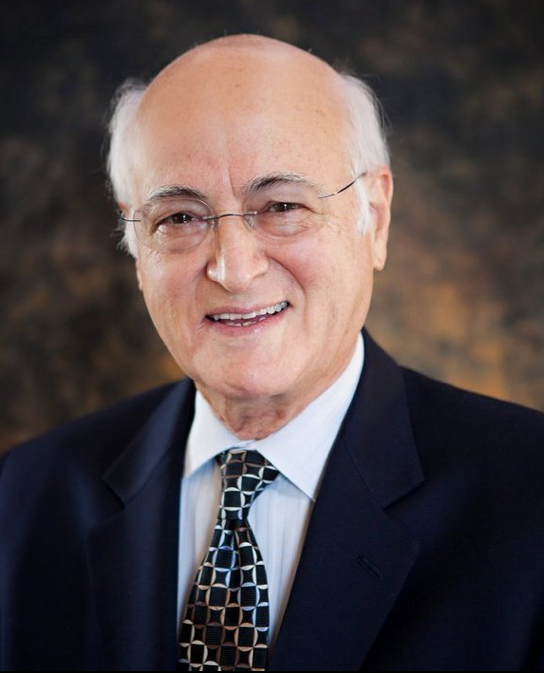 New York Post and a few arabian sources have been digging up interviews with Steve Jobs’ biological Syrian-born father, Abdulfattah John Jandali, who is an Executive Vice President of a Reno casino, Nevada. John is an 80-year old workaholic, determined to avoid retirement at all costs. For all his accomplishments, the Syrian immigrant says he is overcoming with guilt over his treatment of 56-years-old Jobs, and, given his son's health woes and decision this week to step down as Apple CEO, fears his time is running out. According to France-based Hardmac, Apple is preparing a remote testing tool for iOS devices that will be used by its service personnel. It will remotely check a device and send the obtained data, relatively anonymously, over the Internet. Apple technicians have already used a similar tool, but, according to Hardmac, this one works remotely. Actually, it will operate entirely online.